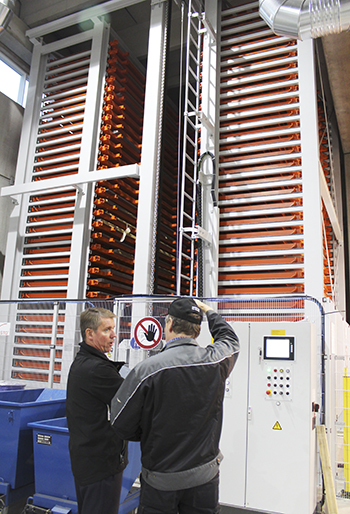 VAK’s new metal hall increases reliability of delivery and quality of products. During the last few weeks, the new metal hall has been arranged and deployed at VAK’s Vahto plant. The 2,600 square metres of production premises, two laser cutters and extremely modern automatic warehouses enable the production of even higher quality products within the agreed schedule. Four million euros is a large investment in body manufacturing. Due to the new hall and modern machinery, the part production capacity of the plant will increase significantly. ”We aim to be able to manufacture products from start to finish on the same plot. In this way, both the quality of products and the reliability of delivery will increase. We are able to react to changes quicker, and the management of the entire process is facilitated,” Mauri Laine says as he describes the advantages of the new hall. Laine explains that the new fibre laser is also 40 percent quicker than older models in cutting thin stainless-steel boards. The new production premises have been split in to several modules, which each handle one work stage. The placement of workstations ensures that the chassis of trailers move from one work stage to another in an efficient manner. The new automatic warehouses have also been placed near the workstations. This means that moving materials from one place to another will be reduced. Each automatic warehouse can hold up to 180 tonnes of steel pipes and boards, which are used to build e.g. trailers’ chassis posts. ”When an installer needs something from the warehouse, he enters the product code on the automatic warehouse’s computer and the correct board will be collected for him by the board tower. When something is returned to the warehouse, the board tower transports it to its correct compartment. Materials continuously remain in order,” Mauri Laine says while he praises the system. Over the autumn, the fluidity of production has been aimed to be increased in old facilities as well. For example, a second line has been built for the assembly of chassis by rearranging the premises. Without people, the hall and machines would not work. That in mind, new employees have also been hired during the autumn for the production of chassis. Approximately twenty new permanent employments have been concluded. VAK employs a total of approximately 500 people. Each automatic warehouse holds up to 180 tonnes of steel pipes and boards, which are used to build trailers’ chassis posts. Supervisor Mauri Laine (right) presents the operations of the automatic warehouse to Jarmo Laine.